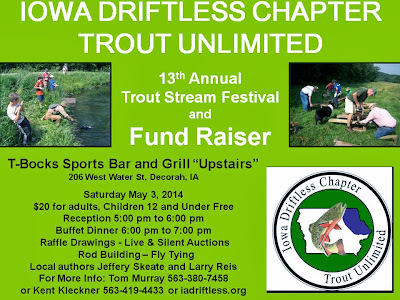 The 2014 Driftless Trout Unlimited Fundraiser is scheduled for the evening of May 3 in the upper level of T-Bocks in Decorah. Rumor has it, a trout carving by local artist Curt Jones will be auctioned. As in past years, your $20 admission ticket will help provide important support for trout stream habitat improvement projects in northeast Iowa. -A tasty buffet supper will be provided for all attendees. -Driftless chapter members will offer tips on rod building and fly tying for trout and smallmouth bass. -Local author Jeffery Skeate and Larry Reis will be on hand to sign their books. -Participate in silent and live auctions and bucket raffles for top quality items throughout the evening. We hope you and your friends and family will be able to join us on Saturday, May 3rd at T-Bock's Sports Bar & Grill "Upstairs". The reception will begin at 5:00pm and the buffet supper will be served at 6:00pm. For more on ticket or fundraiser information, please contact Tom Murray at 563-380-7458, Kent Kleckner at 563-419-4433 or iadriftless@gmail.com. A BIG thank you goes out to all who helped in any way with our fundraiser event. It was a huge success! The money raised will go toward helping us invest in future habitat projects and ensure fishing opportunities will be available for the generations to come.